With a decidedly fresher face and its aggressive new stance, the all new Ford Fusion comes in a variety of styles, efficiency levels and option packages across three trim levels. The range of engines includes a traditional gas engine, two high efficiency EcoBoost engines, a hybrid and a plug-in hybrid model – complete with the hot-blooded, sport-tuned 2013 Ford Focus ST.
As the Fusion was redesigned, Ford’s primary goal was achieving unparalleled fuel economy in a driver-centric car, featuring an enhanced and carefully sculpted exterior. Beginning this month, three TV advertisements will debut during a mix of prime-time network programming and various broadcast sporting events. The first spot portrays the Fusion as the last car remaining as the competitors models fade into nothingness. In the second a Fusion goes cliff diving, as the narration explains free flight is the one thing beyond the vehicle’s capabilities. 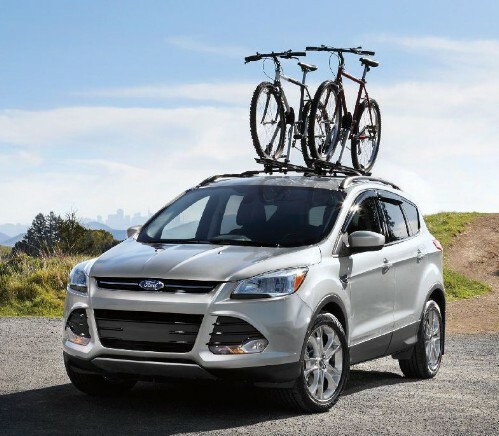 The final spot implies Ford is outdistancing the competition through innovation as the Fusion jumps towards its destination as the other vehicles simply back away. Naturally the spots highlight the Fusion’s fuel economy, lead by the 47-mpg rating of in the Fusion Hybrid and the plug-in electric’s 100 MPGe estimate. The new ads follow up the online prelaunch digital promotion called Random Acts of Fusion, starring Ryan Seacrest along with a set of print ads by Chinese artist Liu Bolin. Two million people visited the website generating almost 12 million views. Even before the sales launch, Fusion had picked up 100,000 new Facebook fans. The Random Acts of Fusion campaign will be continued via digital and social channels, eventually providing new experiences to fans and hopefully skeptics, as well. In one such video, Ford catches a skeptic named Michael unaware who doubts the performance claims of Ford’s EcoBoost engines. In the spot, Ford knocks on Michael’s door and takes him for a hot lap in a new Fusion at a nearby racetrack. To find out what Michael thinks afterwards, we’ll have to wait for the posting. The spots celebrate the Fusion’s all-new design and how it brings alive the next generation of more expressive vehicles from Ford. The new ads will be placed in highly rated sports coverage and other popular programs. The new Fusion is on sale now at Ford dealerships.